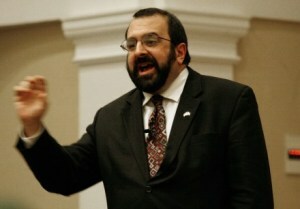 Hate-blogger and career bigot Robert Spencer issued an open challenge to debate numerous times on his vitriolic site. LoonWatch accepted his challenge. It has now been officially 155 days since Spencer has avoided the debate. By Spencer’s own logic (whereby anyone who dodges a debate is a chicken), this makes him a big fat chicken. This is why I recently published an article entitled JihadWatch Afraid to Debate LoonWatch. Instead of taking up his own challenge to debate, Robert Spencer now tries to take the chicken’s way out and has started throwing out wild Glenn Beck style accusations against LoonWatch. Of course, this is no different than his normal M.O., which involves saying absolutely outlandish things and then simply repeating them over and over. And so, Spencer now calls LoonWatch an “Islamic hate site.” Next thing you know, Glenn Greenwald will be an “Islamic supremacist” and “stealth jihadist” to JihadWatch! To give “proof” that LoonWatch is an “Islamic hate site”, the best Spencer can do is reproduce a comment posted by a random reader of our site by the name of Mosizzle. Amazingly, Mosizzle (whoever he is) is not even a part of the LoonWatch team, nor has ever worked for us, nor has anything to do with us! He’s just one of the thousands of people who read our website and decided to post a comment under one of our articles. Muhammad was an insane goat and camel f**ker. Will Robert Spencer condemn SaleemSmith for saying this? And is it now fair to say that “JihadWatch calls Muhammad an Insane Goat and Camel F**ker”? evict from Germany, back to various parts of dar al Islam, all known Muslims (including native German converts to Islam; converts have shown a distressing tendency to involve themselves in Jihad plots). How to reduce the danger of raids carried out from outside? Don’t let any more Muslims into Germany. Not students, not tourists, not businesspeople, not diplomats, no nothing. No Muslims allowed on German soil, would make life much more difficult for planners of jihad raids. Could we not amend that fine premise to ‘No molsems allowed on non-moslem soil.’? I believe a decent leader should prevent an attack by issuing threats that islams capital would be nuked (mecca) is theres a single attack in the country. Do NOT surrender to these animals. TJ please do not spread such vile mischief. Believe it or not, America cannot use nukes against any land that is filled with oil, it will be slow suicide. Ronald could care less that millions of civilians would be killed. He cares about the oil over civilians, like all good neocons do. Yes! Staright talk, straight solutions. Fortunately, slowly but surely, we are getting to that stage. “That stage” refers to the Final Solution, i.e. ridding Germany of Muslims. Then finally, we have someone who opposes this Final Solution to Rid Germany of Muslims idea. Ahh, the voice of reason on JihadWatch. Of course, the same poster offers his own solution which involves “dropping a load of old shoes over the grand mosque and kaaba stone of mecca”. He argues that this is a “perfect solution” because it would “be pure insult and humiliation.” He also notes that he has many other such ideas which are even more insulting than this, and then encourages the other readers to come up with “their own creative suggestions.” So, this is the voice of reason on JihadWatch, the only user who actually opposed the Final Solution idea in the entire thread. I think it is time for a mass roundup and deportation, There is plenty of room in the sands of Arabia for all of them. Pig parts, pig blood and perhaps waste towels from the bath houses of the lower east side (Village) NYC could be dropped on the holy land. Then we have the last commentator on the page, the same one who came up with the idea to ethnically cleanse Germany of Muslims, chastise Ronald for being against the “nuke Mecca” idea. In Ronald’s defense, however, it should be noted that he never claimed we shouldn’t nuke Mecca because it would kill filthy Muslim civilians, but because of the oil. So c’mon crazy JihadWatch readers, cut him some slack! Dumbledoresarmy addresses the crazed JihadWatch crew with the words “ladies and gentlemen” and then explains why nuking Mecca is a good idea. And that’s the last post in the article. Thirty-five comments by JihadWatch readers, and not a single one who opposed the idea of ethnic cleansing of Germany (or the entire non-Muslim world) and the nuking of Mecca on ethical grounds (with the notable exception of Ronald who thought that it would mean losing the oil reserves and another user who thought there are more creative ways to deliver “pure insult and humiliation” upon Muslims). Not a single commentator on the thread opposed either of these two ideas on moral grounds. Not a single peep from the ever vigilant Robert Spencer or any of the other moderators on the website either. The fact that any comment remains on the site IN NO WAY constitutes an endorsement by Jihad Watch, or by Robert Spencer or any other Jihad Watch writer, of any view expressed, fact alleged, or link provided in that comment. If Spencer can use this defense of his site, then why does not the same apply to LoonWatch? Therefore, even if–hypothetically speaking–an “Islamic supremacist” were to post a threat against Spencer on our site, it would not be (by Spencer’s own logic) attributable in any way to LoonWatch. After all, JihadWatch commentators had threats against not just one person but against an entire religious group! Like all cancers, this one needs to be cut out before it spreads. Anyone who has ever spent more than three minutes of their lives on the internet well knows that people are “proverbially speaking” when they say such things. For example, when the Huffington Post says “Jon Stewart Destroys Fox News…” or Fox News says that “O’Reilly Destroys Eminem and Media Matters”, nobody actually seriously thinks that Fox News has actually literally been destroyed or that Eminem or Media Matters are actually dead. Or when someone says “Stewart Rips Maddow”, nobody actually thinks that Maddow has been literally ripped into little pieces. Or when someone online says “Maddow eviscerated [someone]”, nobody actually thinks that the person has been literally eviscerated. Mosizzle’s comment, in the context of epic blog language, is the most normal thing in the world. In fact, the “[blank] is a cancer that must be cut out” phrase has been used only just a million times on the internet, never once being interpreted as an actual death threat. For example, this neocon clown asks “Is Progressivism a ‘cancer’ that must be cut out of the American system?” I am a progressive in the American system; should I claim that I have been threatened? Glenn Beck also uses the “[blank] is a cancer that must be cut out” phrase. Maybe Glenn Beck is not a good example (because he is nuts), but the point is that most people would not think that Beck is actually advocating physical violence by such a phrase. Interestingly, the “Islam is a cancer in America that must be cut out” is very familiar and Spencer never seems to object to it. In any case, Mosizzle himself clarified his statement, by saying that he was “just implying that we must refute Spencer’s lies now before he become more influential…” So, it is exactly as I initially thought it was: it was not a threat of physical violence at all. Instead, it was a call to refute his lies before his influence spreads. The phrase was used in the same way “destroys”, “eviscerated”, etc. is used in blog talk. Calling for someone to get lashed 100 or 101 times cannot really be understood as “proverbially speaking” nor is it a common saying. (Admittedly, I think it was nothing more than him just losing his temper…) So basically on the one hand we have on LoonWatch a comment using a phrase most commonly used in the proverbial sense by a random reader of our site who is not even a part of the LoonWatch team…(Nowhere in the quote by Mosizzle is violent action called for.) And on the other hand we have a threat that explicitly says I should be lashed, a threat issued not by some random reader of JW, but by the main man himself! Furthermore, this entire idea of “the commentators on my site don’t reflect on me at all” is a bunch of baloney. The fact that JihadWatch attracts so many crazy bigots speaks volumes about what JihadWatch is all about. It’s food that fuels the bigots, and that’s why so many of them are there. We at LoonWatch have some crazies who roam our site (which website on earth doesn’t!?) but unlike JihadWatch, they are just a tiny percentage. Not only that, but someone will challenge a person if he says something crazy like that. As for Mosizzle’s comment, I am sure that most loyal readers thought like me that his comment was proverbial in nature. And Robert Spencer knows that. The fact that he’s forced to use the words of random visitors to our site–and superimposing it upon us–tells us very clearly that he knows he has got nothing on us, so he must rely on indirect means. How desperate is Spencer to get at us, and how truly far he has to go to find something against us! Remember I told you that Robert Spencer is a liar? He feels no compunction in misleadingly titling his article: “Islamic hate site says Spencer is like a ‘cancer’ that must be ‘cut out. '” Yet, our website never said that. It’s not just poor form to write like this; it’s outright lying and libel. This from the man who keeps crying about people supposedly doing that to him. He can dish it out, but he can’t take it. The way Robert Spencer tries to superimpose a “threat” on the words posted by Mosizzle show how truly desperate Spencer is to get a death threat. In the deranged world of Islamophobia, the more death threats and fatwas you have against your head, the more cred you have and the more books you can sell. No wonder the cover of Spencer’s book The Politically Incorrect Guide to Islam (and the Crusades) is emblazoned with a death threat against Spencer made by some crazy internet Islamic extremist, and no wonder it boasts “[Robert Spencer] lives in a Secure, Undisclosed Location.” And yet in an interview available to the whole wide world to see, Spencer reveals his “undisclosed location” as “New England.” If his life is really in such great peril from the Bad Guys (which no jail but Gitmo can stop apparently), why is he revealing his location? And then why is he simultaneously printing books claiming that his location is “Undisclosed”? All of this shows his sheer fraudulence. It’s all histrionic theatrics and sensationalism designed to sell books. The whole “I-have-death-threats-against-me-for-this-book” thing is as trite as the “Warning: Images too graphic for some”…These are just gimmicks designed to entice the viewer. Oh, you’re getting death threats? Then I must read your book to find out what you say! Officials should proclaim a moratorium on all visa applications from Muslim countries, since there is no reliable way for American authorities to distinguish jihadists and potential jihadists from peaceful Muslims. Because this is not a racial issue, these restrictions should not apply to Christians and other non-Muslim citizens of those countries, although all should be subjected to reasonable scrutiny. As for dumbledoresarmy’s support for ethnic cleansing, Robert Spencer was caught joining a white nationalist genocidal facebook group that advocated the same exact thing that dumbledoresarmy did on JihadWatch: ethnically cleansing a country (Turkey in this case) of all Muslims. As for nuclear annihilation of Muslim lands, Robert Spencer posted a video advocating the nuclear annihilation of Pakistan. So there can be no equivalence between the singular comment found on LoonWatch and the countless comments on JihadWatch. Had anyone actually threatened Spencer, we would have called him out as a loon. Will Robert Spencer strongly condemn as loons those people who post on his site calling for ethnic cleansing and nuclear genocide against Muslims? We’re not asking just to reject what they are saying, but to clearly say that any who say such things are nutjobs. The truth is, however, that such people characterize the vast majority of JihadWatch’s loyal readers. Anyways, it is amazing how Robert Spencer chooses to focus on one teeny-tiny comment from someone who is not even a LoonWatch writer, instead of tackling the hefty arguments I have thrown his way. Quite telling. Also interesting is the fact that Robert Spencer and his minions mine our site looking for stuff to use against us even reading our comments section (whereas I would blow an aneurysm were I to read the comments section of JihadWatch for longer than a few minutes! ), and yet Spencer still can’t get himself to say the name of our website. How truly juvenile. In that regard, I dedicate this song to him. In the above article, I eviscerated Robert Spencer–proverbially speaking I assure you. 45 year old childless men sitting at home visiting atlas shrugs? Are they sure what kind of site it is? A 51 year old in a bikini…They must be desperate! Atlasshrugs2000.typepad.com is ranked #28,139 in the world according to the three-month Alexa traffic rankings. Visitors to the site view 1.4 unique pages each day on average. Visitors to the site spend roughly three minutes per visit to the site and two minutes per pageview. Roughly 76% of visits to Atlasshrugs2000.typepad.com are bounces (one pageview only). Compared with internet averages, it appeals more to users who are over the age of 45; its visitors also tend to consist of higher-income, childless men browsing from home who have attended college. In fact i was expecting the opposite..it is awesome!With Danios’s Jihad coming soon i am expecting it to increase enormously..
That really surprises me Aamir! Seriously, I never never expected that. What about old Pam’s site? Based on internet averages, loonwatch.com is visited more frequently by users who are over 65 years old and browse this site from home. There are 195,449 sites with a better three-month global Alexa traffic rank than Loonwatch.com. The time spent in a typical visit to this site is approximately three minutes, with 80 seconds spent on each pageview. The fraction of visits to the site referred by search engines is roughly 19%. While we estimate that 42% of the site’s visitors are in the US, where it is ranked #130,388, it is also popular in Canada, where it is ranked #23,530. Approximately 63% of visits to Loonwatch.com consist of only one pageview (i.e., are bounces). Those SS guys and the Nazi strongmen, divested of their uniforms and their attributes of power looked pathetic, mediocre, insignaificant, like teh vermin they made their victims out to be. Same goes for those terribel Chetnik militiamen of Bosnia or the Hutu killers of Rwanda. When will people ever learn that all fascists are worthless? I mean look at Booby Spencer here, at Radovan Karadzic, at Tudjman, at Goebbels, are they by any means admirable figures? Read their messages of hate, aren't they actually very dumb and ridiculous?